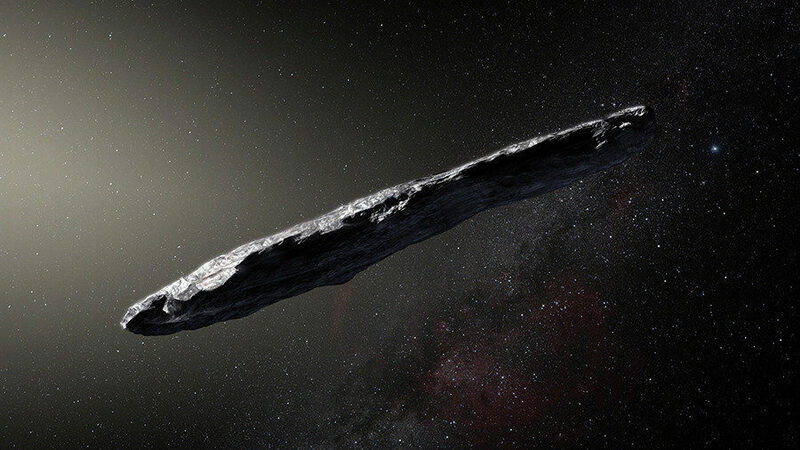 Recent claims by Harvard University researchers that an interstellar rock, zooming through our solar system, might have been sent by aliens has been dubbed an “outlandish idea” by astrophysicists. Oumuamua, the first known interstellar object to enter our solar system, is 1,300 feet long (400 meters) long and about 130 feet wide. First observed by space telescopes in October 2017, the pointy space rock picked up speed when passing the Sun – making the researchers think it may run on sunlight. They say this “unexplained phenomena” means it would have to have a “very large surface and be very thin”, which they say is “not encountered in nature”. Their paper is due to be published in ‘Astrophysical Journal Letters’ on November 12. Now, that theory has been challenged, as a figment of an overly active imagination, by scientists who say it’s a nice idea, but simply not accurate. “Like most scientists, I would love there to be convincing evidence of alien life, but this isn’t it,” Alan Fitzsimmons, an astrophysicist at Queen’s University, Belfast, told the AFP. “But until every other possibility has been exhausted dozen times over, even the authors probably don’t believe it,” she cautioned. This entry was posted in News and politics and tagged Alien Space Craft, Harvard University outlandish, Spacecraft Theory dismissed. Bookmark the permalink.